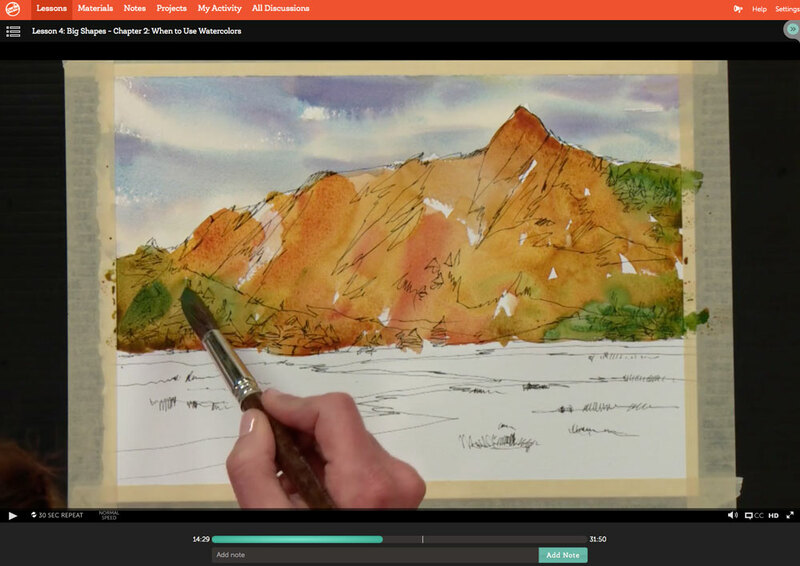 I am thrilled to launch my first online video class “Sketching Landscapes in Pen, Ink and Watercolor” today (on my birthday!) at Craftsy.com. The course is 2.5 hours long, and in seven lessons we cover all the steps I use when I’m sketching in the field. We start with a peek through my sketchbooks (yes, I carried them all to Denver in my suitcase!) and a glance at the materials I use on location. 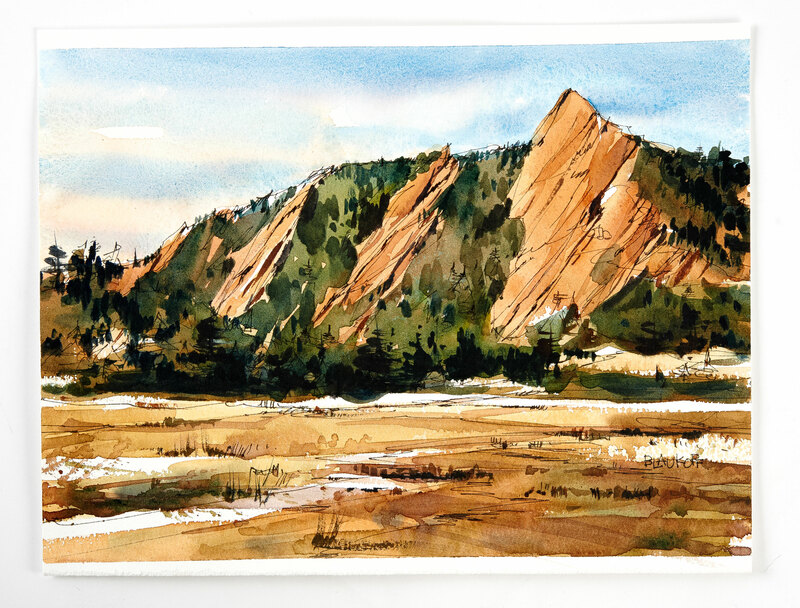 From there we journey to the Flatirons in Boulder at sunrise to work on composition and value sketches. 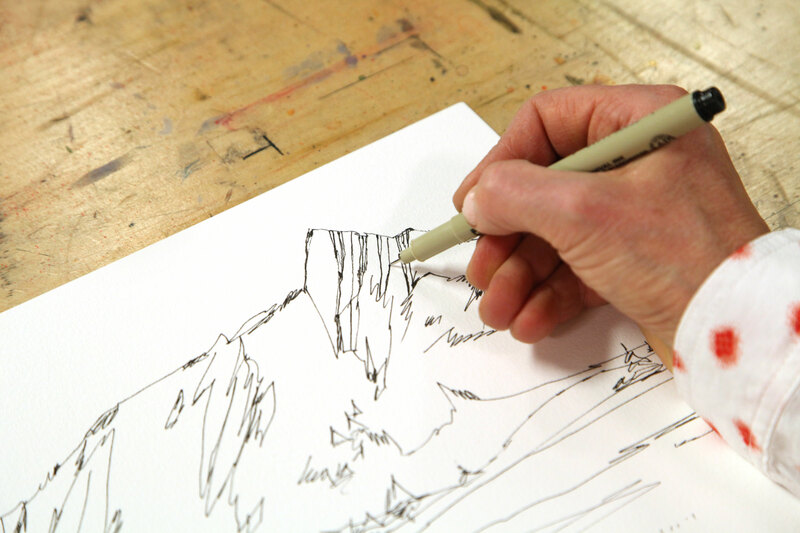 Back in the studio, I go through the step-by-step painting of different types of skies, and then draw and paint the Flatirons scene, along with other common landscape elements such as trees and foregrounds, adding in texture and darks along the way. I hope that breaking it all down into steps will make it easy enough for any viewer to try out the steps on their own. It was an interesting and exhilarating experience to create this course, but I couldn’t have done it without the help and guidance of all the talented people at Craftsy. In preparation, I had to really think through the steps of how I work, and this helped immensely during the shoot. You’ll find plenty of great shots of my palette, so you can see how I mix colour for each scene and how different types of pens create texture. If you haven’t seen the Craftsy platform yet, you’ll be impressed by the way it works. You can speed up or slow down the video, make notes, ask me questions, post your projects and see what other students are working on. As an instructor, it’s an interactive experience for me too, since I can answer individual questions and give feedback on projects (it’s almost like being in one of my summer workshops). And once you buy the class, you can watch it as often as you like. If you register through my blog, there’s even a special discount. Register for the class at the discount rate! Since this is the start of my summer sketching season, I’ll be posting new sketches on the projects page too. I’m thrilled with how my online class turned out and I look forward to seeing your projects. So get out there and do some landscape sketching! wuauuuu Since I “know” you I have allways liked your colors, you know it! I will look your vidéo tomorrow and hope to learn to be able to do the same style of colors as you!!! Thanks so much Tony. Have a great holiday. I’ve always wanted to see Vienna so you’ll have to let me know what it’s like. Just signed up! I know it will be great. I think the Craftsy classes are a bargain and very well done. I have to go check the supply list now! I think they’re a bargain too. I hope you like the class. As for the supplies, you probably have everything already, and if not, just work with what you have. No need to get anything fancy for this. Thanks so much for your good wishes Chris. That discount rate is really a good deal. Can’t do the class now, but I hope it’ll be available for awhile at that price. Looking forward to it, Shari! As long as you have that link the price should remain the same. Thanks for writing Julia. I just need to clarify what is not working. When you click on the link on my page to register, is that what doesn’t work? Or is it when you try to register on the Craftsy site? I know other people have already registered so the link is certainly working for some people. If you let me know, that would be helpful. Thanks! Brent and I have bought a house in Kelowna and sold our house here in Edmonton so I’m not sure when I’ll have time to sit down and do the course but I have it for when I can. Thanks for doing it! Funny I was thinking about you this morning because I heard a friend from Montreal is coming for 3 days in July. Hi Tracey, How wonderful for you to be in the Okanagan. It is so spectacular there and I’m sure you’ll produce some amazing work in those surroundings. What a change from Edmonton. Thanks for taking the time to write and good luck with the move! You have a good summer too. Hi Shari, I got signed up fine with a credit card. It looks like fun & is a great deal too! I’m looking forward to the sessions. Happy birthday! Thanks so much Tom. I’m glad to hear that the payment system worked fine. I hope the video lives up to expectations! Merci beaucoup mon ami. Of course I never age but I do celebrate a birthday. Already signed up and watched the first class. Wonderful work Shari…you’re a national treasure for sure. Thanks so much for sharing your talent. Sent from my Wayne Bissky’s iPad. You don’t know how much this means to me Wayne. Many, many thanks. Fantastic Shari. I’m signed up and can’t wait! And Happy Birthday! I’m excited that you signed up. And thanks for the birthday wishes. Congrats and happy birthday Shari! I feel like we are all getting the hugest birthday treat to see you in action. Can’t wait to watch all the videos!!! thanks! yes the world is small!!!! And just for the record, Shari- the course is AMAZING! Guess who allowed themselves to be seriously distracted today and is working late night to catch up! I feel like I have just spent your birthday (or the day after) in the best possible way, hanging out with you painting! Liz, thanks so much for the great feedback. It means a lot to me to hear what you think since you know the process of doing these so well. See you soon!! I’m glad to hear that you’ll be taking the class Sandi. That’s great news. The good thing about the course is that you can watch it at your own speed and stop to work on some projects that you can then post. Very exciting. Just purchased the class! Can’t wait to watch it. Très bon anniversaire, avec de tels projets et de telles oeuvres d´art, la vie est belle !! Merci. Merci beaucoup Marisa. I have very fond memories of our workshop in Paris. Even in the rain, it was wonderful. I hope all is well with you. Félicitations Shari et joyeux anniversaire. Merci Nathalie. See you soon. Just purchased the class… Can’t wait to get started. Thank you so much Shari, and wish you a very happy Birthday! Hi Shari–I am going to sign up today–looking forward to it–just want to be sure I can access it for a while as we have so much company coming. Happy Birthday–mine it Sunday–let’s celebrate artfully. Robyn, once you buy the course you have lifetime access so you’ll be able to watch long after the company leaves. I hope you enjoy it. Wow! Happy birthday. I’m celebrating by watching your “Craftsy” class. It’s very well organized and you come across VERY well. Good job. I have greatly enjoyed following your blog and looking at your prodigious work. It is such a thrill to finally have a chance to see and hear you talk about your technique and describe the creative process you use. I’m very excited! Jeff, thank so much for celebrating with me. I am looking forward to sketching with you in July. Hoping for good weather so we can sit outside near the lake and watch the boats go by. Thanks very much Sandra. Looking forward to meeting you soon. Hippo Birdee again & just signed up for your class!!! Luba, I’m so excited that you signed up! I hope you like it. And happy birthday to you too!! Happy Birthday! The class is excellent. A bonus is seeing the scenery around Denver, since a family member just moved there. Love it. Thanks so much Julana. I’m so glad you like the class. I hope you’ll be posting some projects on the site. Oh, this looks marvellous….thankyou so much, Shari. I’ve been longing to see you demonstrate your wonderful work ever since I started to follow you (a few years now). I’ve only seen the first lesson and it looks fabulous…so a great promise of things to come. Thankyou again and happy birthday! Thanks so much for writing Ethna. I’m so happy to hear that you registered. I hope it lives up to expectations. Thanks for writing. I hope you like the video. I really enjoyed working on it. I’ve just watched the first 2 segments and already had my money’s worth. It’s brilliant. Can’t wait till I have time to do the sky homework and see the rest of the class. Well done! Hi Shari. I read an article about you in the Gazette a while back. 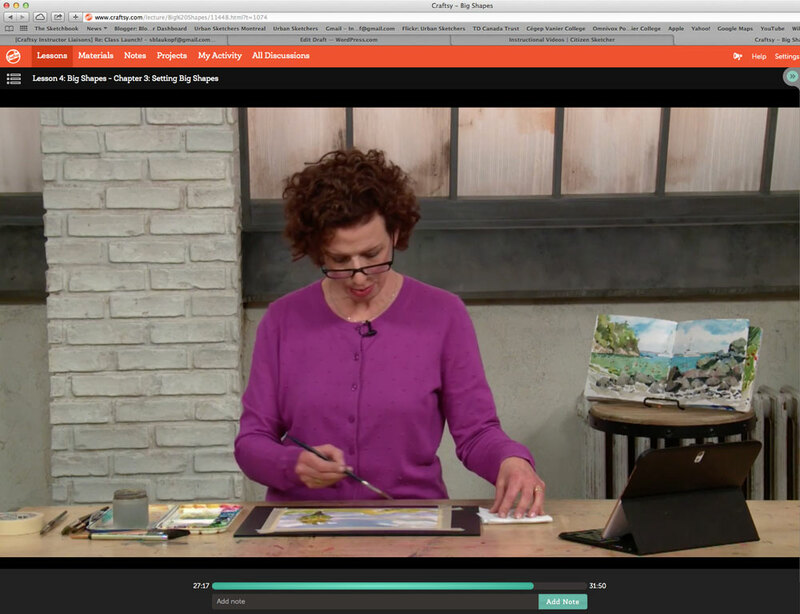 I am an avid Craftsy user, so when I logged on this morning I was thrilled to see that you are teaching a class! I’ve purchased it and I’m off to Omer Deserres to pick up some supplies. Thank you for expanding your classes to an online format. Thanks for writing. I am so excited to hear that you’ll be taking the class. I hope you like it. If you have trouble finding any supplies, let me know. De Serres does not carry the sketchbooks I use, but you can find them at Avenue des Arts on Victoria in Westmount. I am assuming you live in Montreal. Hope you like the class and I look forward to you posting your sketches of some Montreal scenes. Thanks Shari. I will check out the store on Victoria. I’m shy to post, but If I do a sketch in Pointe Claire village I just might do so. I love your sketches from there, and I would love to try to do one of the gorgeous old buildings. A belated happy Birthday to you Shari. The timing is perfect for me, I’ve been working hard on my line work and am now ready to improve my painting skills. Very much looking forward to it and thanks so much for sharing your process!! Hi Barry. Thanks so much for the birthday wishes. I haven’t announced the name of the winner on the blog yet because I only had an email address and no name to go with it. Now that I know who it is (and it is not you unfortunately) I will announce it with my next post. I hope you like the class. I’ll be looking forward to seeing your projects posted on the Craftsy site. Thanks again. Hi Margaret, I am disappointed to hear that you can’t participate in the full Craftsy experience of posting projects but I am so happy that you are liking it. It’s great to hear the feedback after all the hard work. Just watched Lesson 1… that was great!!! Really informative and so interesting to watch you flick through those sketchbooks full of familiar images and to hear you talk about them. I also liked the fact that there was no homework… this is the sort of course that I like. Had a quick initial look at some of the other lessons and was interested to see how the shirt changed colour… there is no mistaking which lesson you are in… purple? – must be Lesson 4. I really think your next video course should be on scuba diving. Hi Ross, I’m glad you’re enjoying the course but I must admit I am a little disappointed to hear that you don’t like homework. I was looking forward to seeing the projects that you could post, if you chose to. Maybe after you watch all of the lessons you’ll decide that you like homework after all. Hola Shari. Happy belated birthday. I got the news of your class via the good folks on Wetcanvas and I had to sign right away. 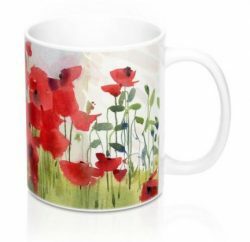 Great to see how you produce those beautiful paintings of yours and learn a lot! I just got your class and loving it. I like that I can watch it offline with the Craftsy app because it’s going to take me a few viewings to absorb everything. I’m so glad you did these classes. I want to improve my urban sketching skills for our trip to Montreal in September. That will be my practice on travel sketching in anticipation of our Europe trip next year. I’m so glad you like it Norma. So far the feedback has been good. If you are in Montreal and want to join our Urban Sketchers group, just let me know. We meet on the 4th Sunday of each month and we love to have visitors. Thank you for the invite, Shari, we’re flying back that Friday but can I ask if you can recommend any must-see sights in Montreal or art stores I must visit? There’s so much to see in Montreal. Go to the old port, go up on Mount Royal, walk on Rue St. Laurent, go to the Museum if Fine Arts. The best art store is Avenue des Arts on Victoria. Thank you for the suggestions. I’ve made a note to check out these places. Is there anywhere in Montreal that I can buy a copy of your book? It would make a perfect souvenir of our visit. I’m so glad you like it Linda. I had your class in my wish list so was able to sign up — but wanted you to know that when I clicked through to the page from the post today (I wanted to see if there was a discount) it took me to a page of discount classes but no matter where I clicked on your class it would not take me through to your class page which has the click to cart. It kept taking me back to the opening page, not to any page where I could add to cart. Fortunately in my wish list it offered the discounted price, so I am good to go . . .
I’m not quite I understand what was wrong but I’m glad it resolved itself. 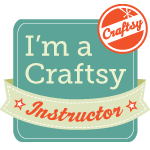 I am taking your class on Craftsy; you are a wonderful instructor and you are giving a great class!! I am a novice with watercolor and have learned so much with just a few lessons. Thank you so very much!! I love your sketch of the Statue of Liberty. I grew up seeing her from my back bedrooom windows. So it was a little view of home for me. Hi Jeanne, I’m so glad you are enjoying the class. I was in New York to attend a family wedding. Near the end of the evening there was a fireworks display over the Statue of Liberty. It had nothing to do with the wedding but for those of us lucky enough to be outside to see it, it was the perfect way to end the evening.